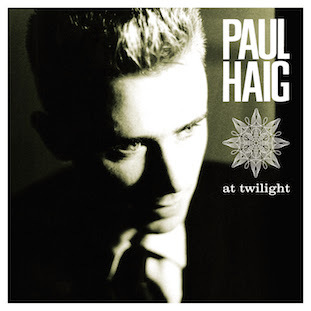 'At Twilight' is a new 2CD compilation of singles and album tracks recorded by Paul Haig for Les Disques du Crépuscule which were variously produced by Alan Rankine, Cabaret Voltaire, Bernard Sumner, Mantronik, Lil Louis, Alex Sadkin and Man Parrish. The second CD includes all nine tracks from the lost Alan Rankine-produced second studio album from 1984 which has never before been released in its complete form. Plus it also includes 'The Executioner', the unreleased collaboration between Cabaret Voltaire and Paul Haig which was originally planned for release on Factory Benelux (FBN 47/48). It all comes packaged with a cover portrait by Charles Van Hoorick and the liner booklet includes archive images and track-by-track commentary by Paul Haig. The compilation will be out via Crépuscule on 20 January 2014. And don't forget that the brand new studio album by Paul Haig is out now.